When the sensory system is impacted by injury or disease, the nerves within that system cannot work to transmit sensation to the brain. This often leads to a sense of numbness, or lack of sensation. However, in some cases when this system is injured, individuals experience pain in the affected region. Neuropathic pain does not start abruptly or resolve quickly; it is a chronic condition which leads to persistent pain symptoms. For many patients, the intensity of their symptoms can wax and wane throughout the day. Although neuropathic pain is thought to be associated with peripheral nerve problems, such as neuropathy caused by diabetes or spinal stenosis, injuries to the brain or spinal cord can also lead to chronic neuropathic pain. Neuropathic pain can be contrasted to nociceptive pain, which is the type of pain which occurs when someone experiences an acute injury, such as smashing a finger with a hammer or stubbing a toe when walking barefoot. This type of pain is typically short-lived and usually quite responsive to common pain medications in contrast to neuropathic pain. Anything that leads to loss of function within the sensory nervous system can cause neuropathic pain. As such, nerve problems from carpal tunnel syndrome or similar conditions can trigger neuropathic pain. Trauma, causing nerve injury, can lead to neuropathic pain. Other conditions which can predispose patients to developing neuropathic pain include diabetes, vitamin deficiencies, cancer, HIV, stroke, multiple sclerosis, shingles, and cancer treatments. There are many reasons that patients may develop neuropathic pain. However, on a cellular level, one explanation is that an increased release of certain neurotransmitters which signal pain, combined with an impaired ability of the nerves to regulate these signals leads to the sensation of pain originating from the affected region. Additionally, in the spinal cord, the area which interprets painful signals is rearranged, with corresponding changes in neurotransmitters and loss of normally-functioning cell bodies; these alterations result in the perception of pain even in the absence of external stimulation. In the brain, the ability to block pain can be lost following an injury such as stroke or trauma. Over time, further cellular damage occurs and the sense of pain persists. Neuropathic pain is associated with diabetes, chronic alcohol intake, certain cancers, vitamin B deficiency, infections, other nerve-related diseases, toxins, and certain drugs. In an effort to help identify how much pain patients may be experiencing, different scales are often used. 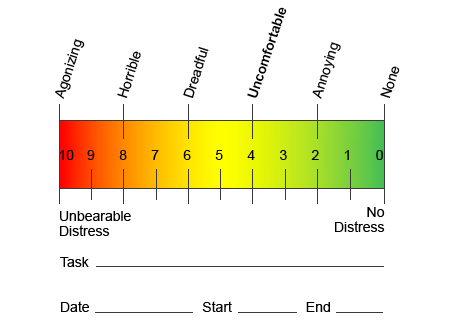 Patients are asked to rate their pain based on a visual scale or numeric graph. Many examples of pain scales exist. Often, pictures of faces depicting various degrees of pain can be helpful when patients have a difficult time describing the amount of pain they are experiencing. Visual analog scale (VAS) for pain. The diagnosis of pain is based upon further assessment of a patient's history. If underlying nerve damage is suspected, then evaluation of the nerves with testing may be warranted. The most common way to evaluate whether a nerve is injured is with electrodiagnostic medicine. This medical subspecialty uses techniques of a nerve conduction studies with electromyelography (NCS/EMG). Clinical evaluation may reveal some evidence of loss of function, and can include assessment of light touch, the ability to distinguish sharp from dull, the ability to discern temperature, and assessment of vibration. Once a thorough clinical examination is performed, the electrodiagnostic study can be planned. These studies are performed by specially trained neurologist and physiatrists. If neuropathy is suspected, a search for reversible causes should be done. This can include blood work for vitamin deficiencies or thyroid abnormalities, and imaging studies to exclude a structural lesion impacting the spinal cord. Depending on the results of this testing, there may be a way to decrease the severity of the neuropathy and potentially decrease the pain that a patient is experiencing. Unfortunately, in many conditions, even good control of the underlying cause of the neuropathy cannot reverse the neuropathy. This is commonly seen in patients with diabetic neuropathy. In rare instances, there may be evidence of changes in the skin and hair growth pattern in an affected area. These alterations may be associated with changes in sweating or perspiration as well. When present, these changes can help identify the probable presence of neuropathic pain associated with a condition called complex regional pain syndrome. Various medications have been used in an attempt to treat neuropathic pain. The majority of these medications are used off-label, meaning that the medication was approved by the FDA to treat other conditions and was then identified as being beneficial to treat neuropathic pain. Tricyclic antidepressants (amitriptyline, nortriptyline, desipramine) have been prescribed for control of neuropathic pain for many years. Some patients find that these can be quite effective in giving them relief. Other types of antidepressants have also been shown to provide some relief. Selective serotonin reuptake inhibitors (SSRIs like paroxetine and citalopram) and other antidepressants (venlafaxine, bupropion) have been used in some patients. Another common treatment of neuropathic pain includes antiseizure medications (carbamazepine, phenytoin, gabapentin, lamotrigine, and others). In severe cases of painful neuropathy which don't respond to first-line agents, medications typically used to treat heart arrhythmias may be of some benefit; however, these can lead to significant side effects and must be monitored closely. Medications applied directly to the skin can provide modest to pronounced benefit for some patients. The forms commonly used include lidocaine (in patch or gel form) or capsaicin. Multiple arguments have been made both promoting and vilifying the use of narcotic agents to treat chronic neuropathic pain. No specific recommendations regarding the use of narcotics will be made at this time. Curing neuropathic pain is dependent on the underlying cause. If the cause is reversible, then the peripheral nerves may regenerate and the pain will abate; however, this reduction in pain may take many months to years. Many patients with neuropathic pain are able to find some measure of relief, even if their pain persists. Although neuropathic pain is not dangerous to a patient, the presence of chronic pain can negatively impact quality of life. Patients with chronic nerve pain may suffer from sleep deprivation or mood disorders, including depression and anxiety. Because of the underlying neuropathy and lack of sensory feedback, patients are at risk of developing injury or infection or unknowingly causing an escalation of an existing injury. The best way to prevent neuropathic pain is to avoid development of neuropathy. Monitoring and modifying lifestyle choices, including limiting the use of tobacco and alcohol; maintaining a healthy weight to decrease the risk of diabetes, degenerative joint disease, or stroke; and using good ergonomic form at work or when practicing hobbies to decrease the risk of repetitive stress injury are ways to decrease the risk of developing neuropathy and possible neuropathic pain. Magrinelli, F., et al. "Neuropathic pain: diagnosis and treatment." Practical Neurology 13.5 (2013): 292-307. Marchettini, P., et al. "Painful peripheral neuropathies." Current Neuropharmacology 4.3 (2006): 175-181. Mendell, J., et al. "Clinical practice. Painful sensory neuropathy." New England Journal of Medicine 348.13 (2003): 1243-1255.